This weekend, my dear friend, Daffny came from New York to St Louis to hang out with me! We had the best time together. We met online through out blogs and have been chatting almost every day for the past 9 months or so. Meeting her in person for the first time felt like seeing a long-lost friend. Being stay at home moms is hard work and we both really needed the quality girl time. 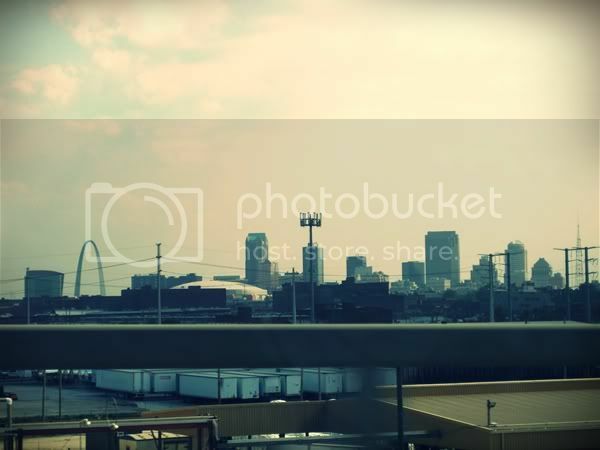 She arrived on Thursday afternoon and we began out St Louis adventure. This is Daffny's first view of the city. We took her to Sweetie Pie's for lunch. Sweetie Pie's is a local foodie landmark, known for southern style soul food. Sweetie Pie's kitchen has been featured The Travel Channel's Diners, Drive-ins and Dives. 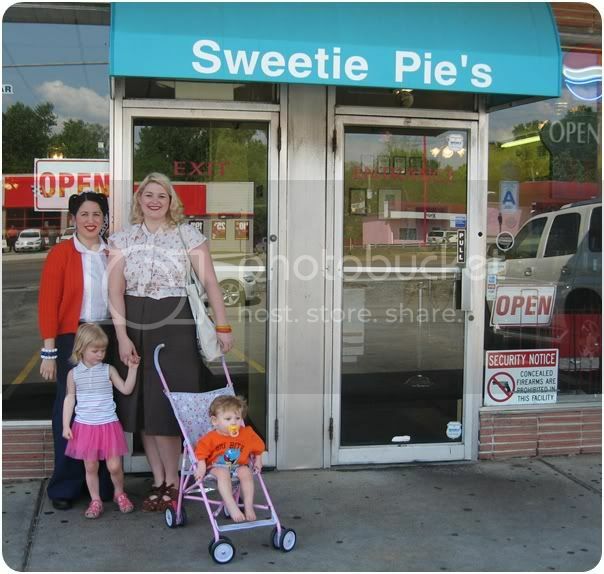 Sweetie Pie's is owned and operated by Robbie Montgomery, who was once a backup singer for Tina Turner. She cooks up the kind of fired, cheesy, gravy-covered southern comfort foods that her mother taught her to cook when she was a girl in Mississippi. Daffny, Pj and I shared our foods with each other so we could have a taste of everything. We sampled the meatloaf, mac and cheese, okra, green beans, corn bread, battered and fried pork chop, mashed potatoes and peach cobbler. After lunch, we went to one of my favorite thrift store shopping spots. I am not the kind of person to keep my shopping spots a secret but there is this one place that I only tell very close friends about! 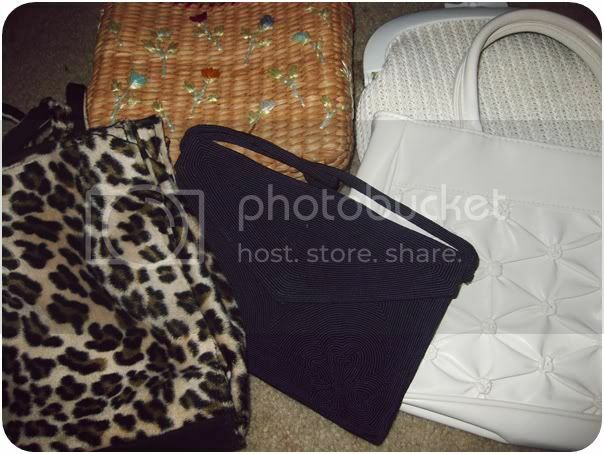 We loaded up on purses, scarves, cardigans and a few dresses. Daffny bought 16 cardigans and I finally found a much needed grey cardi. I also found this beautiful 1940's Corde handbag for $1.69! I have entirely too many handbags so this little lovely went home with Bunny for her date nights with her husband. For myself, I found this non-vintage leopard print handbag. Leopard print accessories was on my shopping list for the weekend so this was a win for both of us! 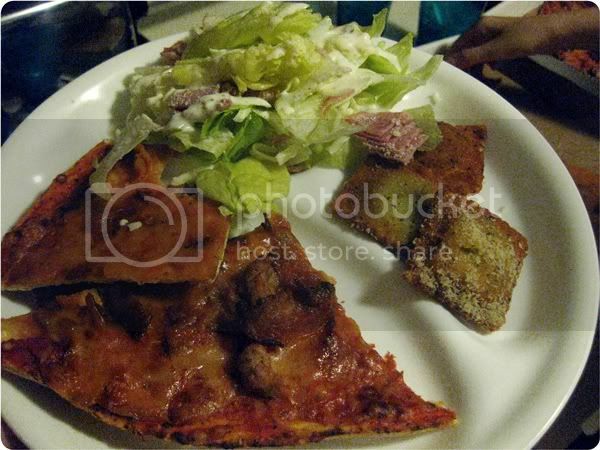 After shopping, we went home and ordered St Louis style pizza and toasted ravioli and sorted through our finds. 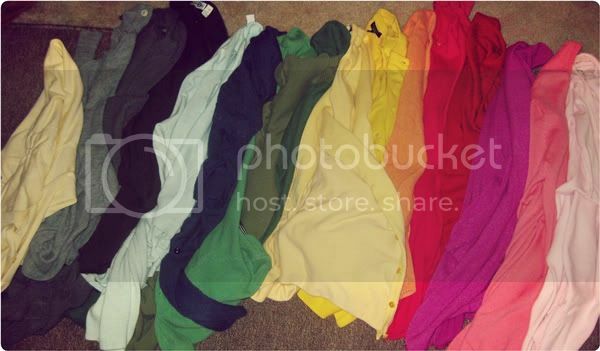 Check out this beautiful rainbow of cardigans! omg!!!!! its so cool seeing you two together! having blog friends is a special thing :)it looks like you two had a blast! and where you live is beautiful! 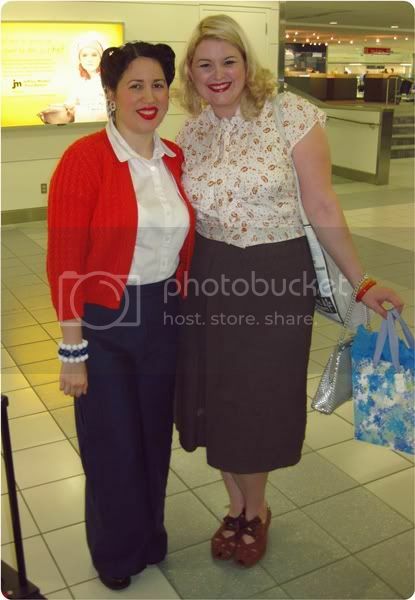 What fun to get to meet your blog friend in person.. Looks like you both had lots of fun.. and I love the array of colors of the cardigans. Sixteen cardigans!? Wow, that is impressive! We have decent thrift stores around my neck of the woods, but I have NEVER walked away with a haul like that! Looks like you girls had fun, I can't wait to see more! How fun, you girls look so pretty! Modern stuff has nothing on you! This is the best friend date there is a little food, vintage shopping. The purse are wonderful, lucky gals! Ahhhh - it is SO nice meeting people in the virtual world!! Looks like you cleared out that thrift store :) And I am now hungry for ANYTHING with gravy. Looks like day 1 was a blast! 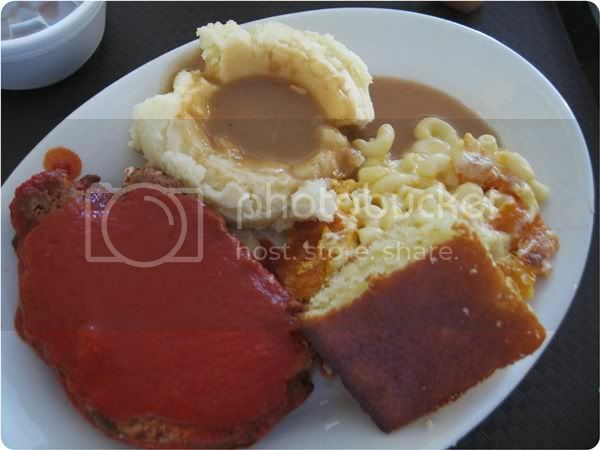 We really need to go to Sweetie Pies sometime, that's looks great. That's a lovely rainbow of cardigans!! OMG ... what a fantastic trip. I´m so sad because in Germany we have a lot of antique stores with furniture and jewelery, porcelain but vintage clothings are rare and the most of them haven´t a god condition. And in my size ... nooo chance.